Apple has set Iran in its crosshairs as being yet another region where the tech giant will be able to increase its overall market cap. However, before the company can commence its barrage of distribution deals in the country, there is one obstacle that stands in its way. U.S. and Iran have to reach an agreement where the latter would eliminate its nuclear program, allowing safe passage to Apple and other companies in this region. Part of the terms included in the agreement are to lift trading sanctions, which will become Apple’s golden to dominate in yet another market. 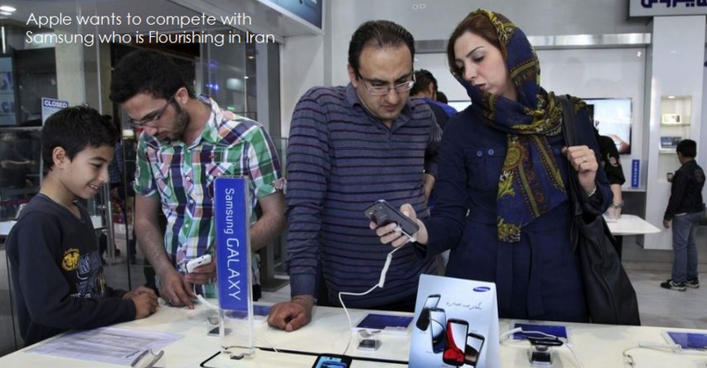 According to The Wall Street Journal, Apple plans on taking the fight to its biggest nemesis in the smartphone industry Samsung, which currently has a strong hold in Iranian smartphone market. If the deal between U.S. and Iran manages to go through, then the Cupertino tech company will have access to potentially 80 million customers residing in the region. This is not the first time that Apple has attempted to enter the Iranian market. According to Patently Apple, October 2014 saw senior Apple executives meeting with potential Iranian distributors at Apple’s regional headquarters on London’s Hanover Street. During the talks, Apple was addressing the idea of having Iranian partners sell Apple’s popular mobile products at so-called premium resellers as they do in certain countries like South Korea. The primary difference separating this and the model used in regions like Europe and Asia will be that instead of company-operated Apple stores, midsized franchises that sell only Apple products will be present. Now, before Apple gets its hopes up that it will finally be able to compete with Samsung, Iran still has to prove to the U.S. government that it is will to comply with each and every requirement present in the agreement, which will be no simple task. Before U.S. companies can actually enter the Iranian market, the agreement must be carried out to the letter. No doubt, the process is said to be very delicate and could stretch out to the later months of 2016. In order to expedite the process, Apple has been reported to be consulting with the U.S. Treasury’s Office of Frozen Assets Control concerning launching its operations in Iran. If the plan goes to fruition, then the most likely scenario we will be looking at is Apple will be choosing its resellers to exclusively sell its products instead of opening its own branded stores (just like last time). The advantage that Apple has is that if the agreement falls during any part of the distant future, it will eliminate the risk for the company. We will be following leads with open ears and update you guys if there have been any progression or regression in the agreement.